Wow! Another opportunity to buy music we already have….Money Grab here, just not my money. Total cash grab, here! Anybody who is a fan of Black Sabbath already has several versions of all of these songs. This vinyl box set thing is just getting WAY out of hand! Not for me! I appreciate some re-releases, box sets, and vinyl releases. But this is ridiculous. There is absolutely no incentive to buy this. How about some live music release from tours? Thats what BS fans want at this point. A must for any music fan but essential for a Sabbath fan. 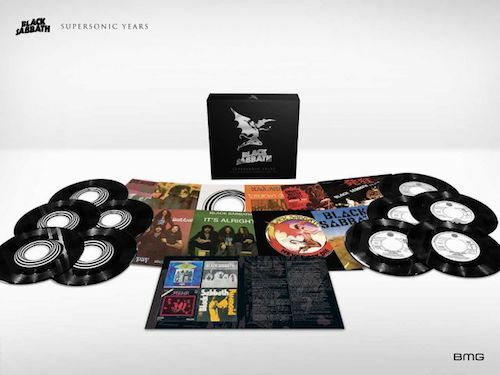 Hear the Black Sabbath singles that span their entire first ten years; with radio edits, you will only hear exclusively through this array of 45s. Perfect for any party; this collection is the go-to for jazzing up any get together and all of the sudden you will be the coolest cat in the room! Cooler than any punk 45 collection or even the first two Plasmatics records for that cachet of hipness so coveted by the entire population (whether they admit it). No! Don’t wait! Buy this awesome collection now!!! It’s a reasonable price for a gift that pays back seven hundredfold. Buy this now!!! !